The fat, eyeless cavefish harbor the same genetic mutation as people with an inherited form of severe diabetes and experience diabetes-like blood-sugar surges and crashes after eating, yet they are perfectly healthy, according to a study in Nature led by geneticists at Harvard Medical School. The discovery "kind of blew my mind," said Ariel Aspiras, co-first author of the paper and a graduate student in the lab of Cliff Tabin at HMS. "Glucose dysregulation usually causes a whole slew of problems, but it doesn't in the fish. It actually appears to benefit them." The fish offer a fresh opportunity to find out how animals can thrive with traits that would sicken humans, said co-senior author Nicolas Rohner, a former postdoctoral fellow in the Tabin lab who is now an assistant investigator at the Stowers Institute for Medical Research in Kansas City, Missouri, and an assistant professor at the University of Kansas Medical Center. "Giraffes have high blood pressure so blood can reach up their long necks, and seals develop extremely high blood-sugar levels, but almost nobody looks at these natural strategies," he said. The study "raises the exciting possibility" that the cavefish have other mutations that protect against the usual harms of poor blood-sugar regulation, said co-senior author Tabin, the George Jacob and Jacqueline Hazel Leder Professor of Genetics and head of the Department of Genetics at HMS. If such mutations exist, studying them could allow scientists to develop new interventions for human disease, Tabin said. "We don't know if studying the fish will directly help us," said Rohner, "but evolution has tried a lot of gene variants over millions of years and I think that's smarter than anything we can come up with, even with machine learning. I think it would be silly not to look." The fish's striking physiology appears to be an adaptation to their extreme living conditions. Pitch-black and almost entirely cut off from the outside world, their subterranean homes provide no food for most of the year. The fish's prolonged starvation is punctuated by springtime floods that sweep in nutrients such as worms and algae. Tabin and colleagues previously revealed that the cavefish have mutations in the same gene as people with insatiable appetites. Although harmful in humans, the altered gene helps the fish eat all they can and hoard body fat in times of plenty. The researchers showed that a remarkably slow metabolism allows the fish to live off that fat until the next flood comes. In the new study, the researchers poked around to see whether other aspects of cavefish metabolism were abnormal. They found that the fish are also insulin resistant: their cells don't respond well to the hormone's cry to absorb glucose after a meal. A hallmark of many metabolic disorders and a precursor to type 2 diabetes, insulin resistance in people can lead to an overworked pancreas, excess fat storage and chronic high blood sugar. Experiments revealed that the cavefish also have constantly elevated blood sugar but don't appear to suffer the consequences people do, such as nerve and blood-vessel damage. "When the proteins in our blood are soaked in sugar all the time, they don't function as well because they essentially get sugarcoated," explained co-first author Misty Riddle, a postdoctoral fellow in the Tabin lab. "The cavefish have high blood sugar, but no sugarcoated proteins. How do they do that?" For now, the answer—which Riddle suggests could inspire treatment strategies for diabetes-associated tissue damage—remains a mystery. Since cavefish aren't a well-studied model for human metabolism, the researchers had to figure out protocols as they went, including developing a fish version of a glucose tolerance test. They compared three different populations of cavefish with their surface-dwelling, metabolically normal cousins and found that the cavefish enjoy equally long lives despite their insulin resistance. The researchers then bred the cavefish with the surface fish and studied hundreds of the resulting hybrids. They found that hybrids with the cavefish mutation weighed more and had higher blood-sugar levels than those without the mutation. Going a step further, the researchers transplanted the cavefish mutation into zebrafish and confirmed that it contributes to both insulin resistance and weight gain. 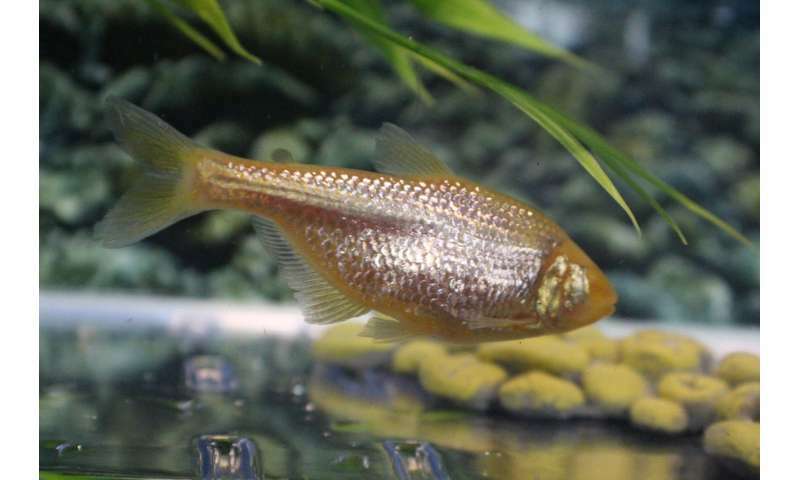 The scientists are now searching for other genes that shape cavefish metabolism. Along the way, they intend to show colleagues that the fish are a useful tool for studying human metabolism. "I hope people get excited about cavefish as a model when they see that we can provide insight into phenomena even as well-studied as insulin resistance," said Aspiras. 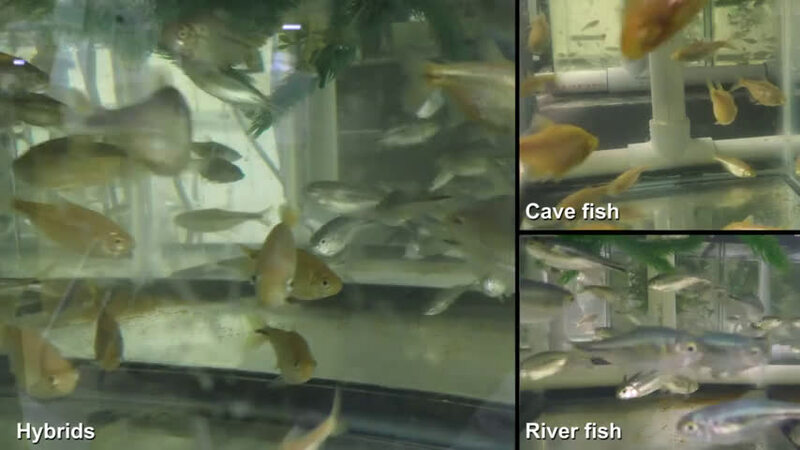 More information: Insulin resistance in cavefish as an adaptation to a nutrient-limited environment, Nature (2018).